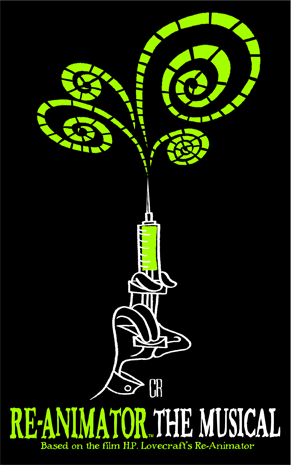 One of my fondest surprises of 2011 was attending a preview show for Re-Animator the Musical, the stage adaptation of Stuart Gordon’s seminal work of gonzo horror, Re-Animator. 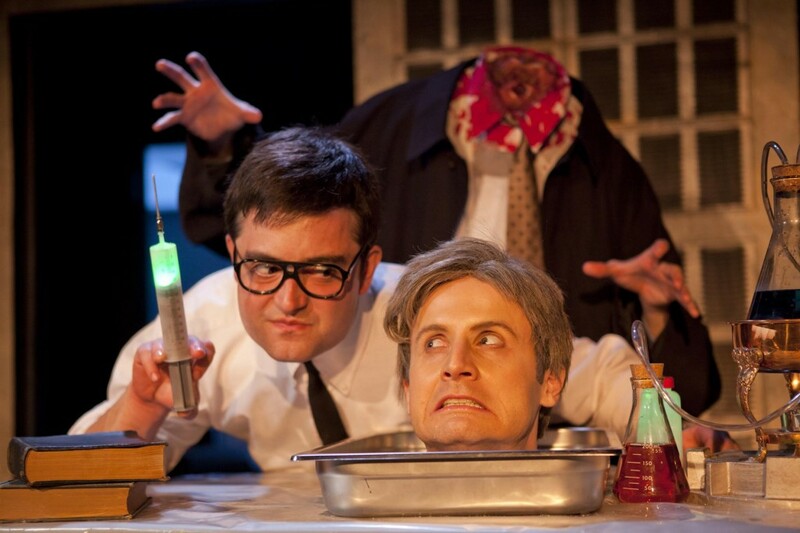 Knowing that Gordon had directed the play – enlisting Re-Animator‘s original screenwriting team to create the book, and the film’s FX team to do the play’s gore and prosthetics – I had been excited for the show. But I hadn’t anticipated that it was going to blow me away the way that it did. I don’t think anyone did. Re-Animator the Musical was the very definition of a “surprise hit.” Staged at The Steve Allen Theater – which is frankly a very loose definition of a “theater,” and is known primarily in LA as a venue for improv and sketch comedy – the play was originally scheduled for a relatively short run. But it was too good to deny. Shows kept selling out as word of mouth spread. Dates were added. Then a national tour happened. Then it won some awards. Now, one year later, Re-Animator the Musical is making its triumphant return to Los Angeles with the original cast (including George Wendt), before heading to New York and an international tour. And I was quite eager to attend its victory lap here in LaLa. Aside from the addition of a new musical number, this remains the same show it was last year, which tempted me to simply re-post my original review. But re-reading my review I realized there are some things worth elaborating on and some things I even want to amend. The other notable change is that the show feels tighter now; the cast a well-oiled machine after a year of touring. There were a few moments where I missed the rough-around-the-edges feeling it had when it first opened, but they’re out-weighed by the overall improvements in the staging — the musical numbers are smoother, and you can tell the actors know just how to spray the audience and which gags are going to get the best response. Plus, no amount of perfection on the actors’ parts can remove the punk rock presentation that Gordon gives us. The show remains as gleefully low-rent and madcap as ever. While obviously the magic of discovery was not present this time around, objectively I liked the play even more. It is just so much fun. Last year I really harped on you needing to have seen Re-Animator the film to truly enjoy the musical. But the play’s incredible popularity I think disproves that logic. While I do assume that anyone who would like the play would also like the film, that’s maybe not entirely true, considering that the musical is a public and fairly communal experience. That said, it was palpably noticeable what percentage of the audience hadn’t seen the film (or at least hadn’t seen it in a long time), as sections of the audience often wouldn’t laugh at some of the funnier in-jokes. I still contend that Gordon designed the play specifically for fans of the film (for example, the above publicity still is a huge spoiler), but wound up making something so wholly enjoyable in its own right that it ended up working for everyone even if they didn’t realize they were laughing at 80% capacity. So if you haven’t seen the film, or haven’t seen it since the 80’s, I wouldn’t let that discourage you. Just know that there are in-jokes and oblique references going on. See the play. Maybe then watch the movie if you’re curious. It is a fantastic film. Re-reading my review, I felt bad for two people. First, composer Mark Nutter, who I sort of steam-rolled by saying that none of his songs were left stuck in my head. Well, I’ve had the song “She’s Dead Dan” stuck in my head for days now. So there you go. Second, actor Graham Skipper, who plays the titular re-animator Herbert West. In pointing out that he isn’t Jeffery Combs I sold the chap pretty damn short. He isn’t Jeffrey Combs, but he also isn’t trying to be. Skipper’s West is an entirely different beast, and one very well suited for the musical. As I talked about in my original review, West isn’t meant to be the hero of the story, but he is the driving force. Combs’ iconic performance affected the tone of the film. Appropriately, Skipper’s performance – though it doesn’t consume the play the way Combs consumed the film – is the driving force of the musical’s tone. He plays the part at maximum throttle in almost every scene, replacing Combs’ creeper twitchiness with ADHD pomp. You half expect a vein to burst in his head during some scenes. Skipper’s performance in particular has only gotten better since I first saw the play. He more than the other actors seems most interested in finding ways to toy with and play off the audience (he also has the role best suited to such things too). My previous and unintentionally unflattering comparison overlooked that fact that those unfamiliar with the film will likely walk out of Re-Animator the Musical praising Skipper much in the same way people walked out of Re-Animator praising Combs. Let’s be honest with ourselves, Chewers. You don’t care about theater. I certainly almost never see plays, because I rarely feel the experience is worth the ticket price — at least here in LA (which has a much crappier theater scene than you might assume). But this is one that I sincerely recommend to everyone. While you are sitting in the theater you will surely think, “Man, if all plays were like this I’d be going once a month.” This is a play worthy of the CHUD crowd.